Happy & Healthy Dog Looking for her Home! SARAH NEEDS A FOSTER OR FOREVER HOME!!!! Currently Living at: Sarah needs a foster or forever home! 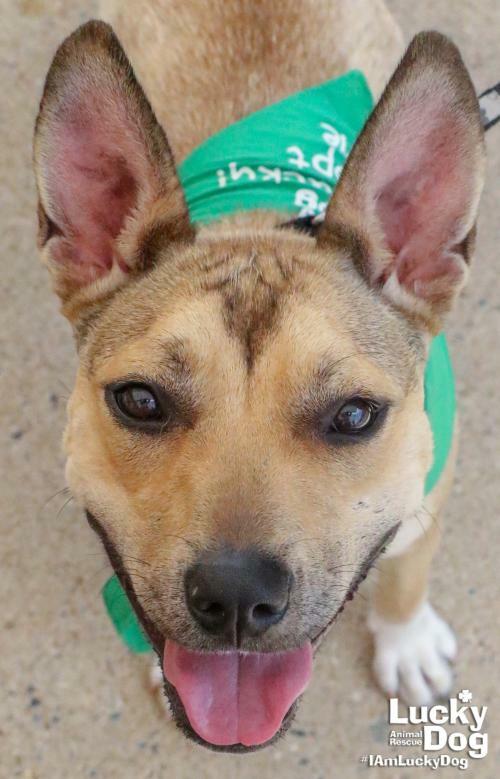 Sarah is Looking For: A family to provide multiple long walks a day with daily trips to the dog parks or daycare to play with all my furry friends! She' also can't wait to go to a family ready to enroll her in training! 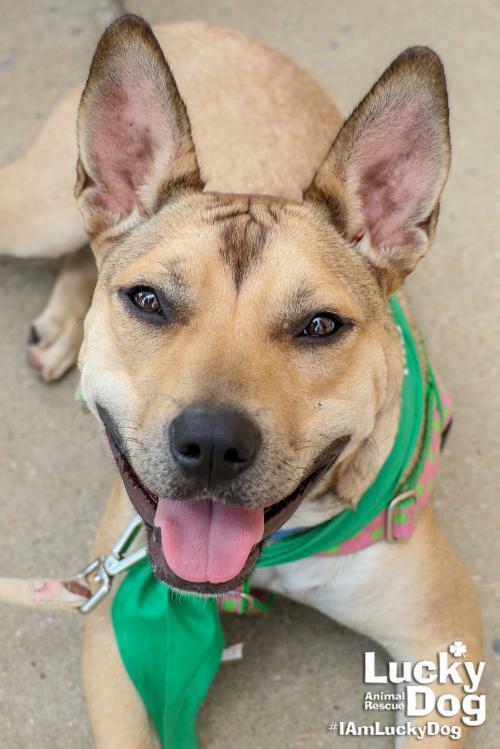 What My Foster Says About Me: Sarah is a very happy dog and always looks like she’s smiling. She has beautiful coloring on her face, and her ears are almost always up like a bunny. She’s also a really good size. She already knows how to sit, is very food motivated, and loves hot dogs! She takes treats gently, even if she really likes the food you’re giving her. She will bark when she is put in her crate but is quiet once she settles down after a few minutes (it’s really just because she likes being around you). She has a funny personality and loves to throw toys around for herself. She really loves the Kong (especially with peanut butter in it) and squeaky toys. She has a tendency to use her mouth when she’s playing and when she likes you, but I have been practicing redirecting her with chew toys. She likes to snuggle and will sometimes bury her head in weird places like your neck and armpit or leave one paw on you if she’s close enough to you. She also likes to sleep in odd and contorted positions, which is really cute. She needs some work on leash manners so she doesn’t walk back and forth in front of you but I’ve been using an easy-walk harness for longer walks with her, and she is fine. She’s a goofy sweetheart, and whoever adopts her will be lucky! Like most shelter dogs, Sarah may need a refresher on housetraining. She/he is likely crate trained. 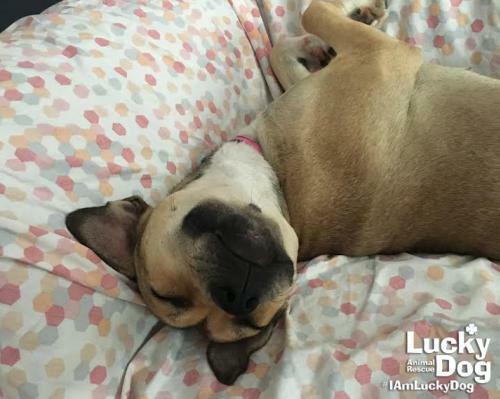 TO ADOPT: Download our Adoption Questionnaire and email it to Ashley at ashleyr@luckydoganimalrescue.org. The adoption fee for Sarah is $350, which includes the cost of routine vetting, including vaccinations and spay/neuter. Lucky Dog Animal Rescue does our best to provide accurate information about the dogs we have for adoption. That said, we cannot make any guarantees about age, breed or temperament. Thank you for contacting Lucky Dog Animal Rescue and helping to save a life! Please visit us online at www.luckydoganimalrescue.org. BE A FOSTER! Fosters make it possible for us to save and care for homeless and abandoned dogs & cats! To learn how to help, email Ashley at ashleyr@luckydoganimalrescue.org! BE A SPONSOR! Sponsors are critical to our ability to save animals. 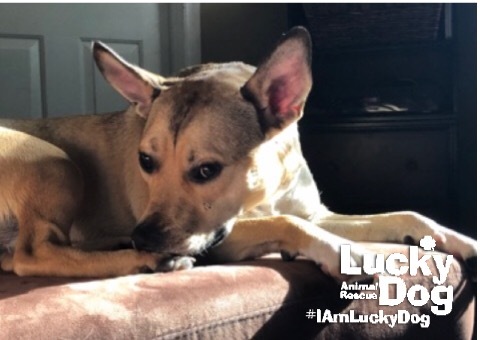 To learn more about sponsorship, email Ashley at ashleyr@luckydoganimalrescue.org!